Dust was in the air, but it was the rocks and loose gravel that made all the difference on the first day of the Gran Prix of Gloucester. 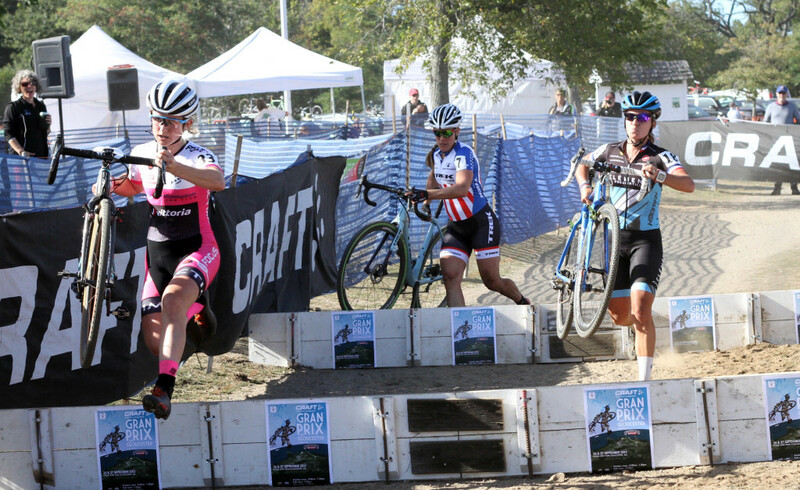 In the Elite Women’s race, Caroline Mani (Raleigh / Clément) took the win after battling Ellen Noble (JAM/NCC/Vittoria) and National Champion Katie Compton (Trek Factory Racing). 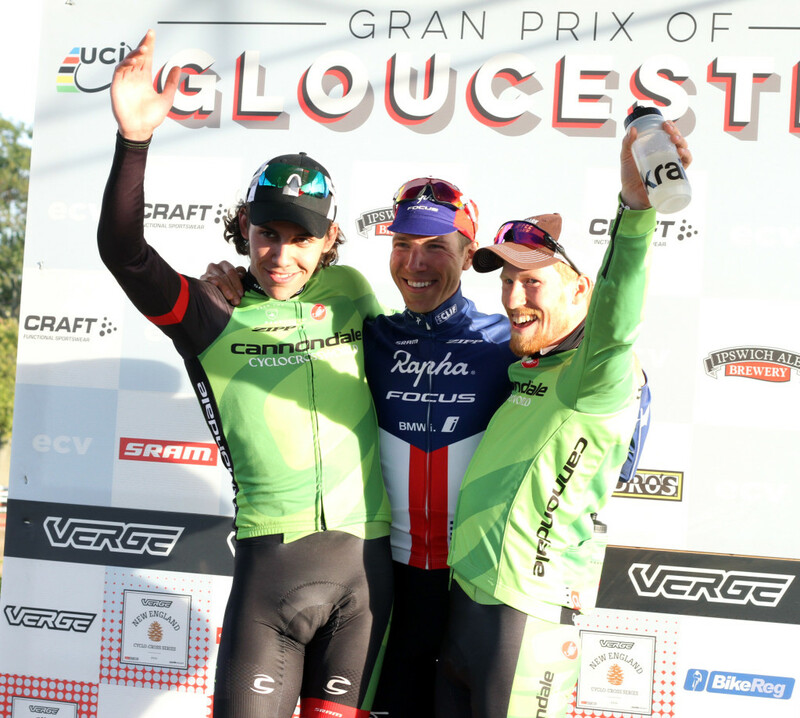 In the Elite Men’s race, current National Champion Jeremy Powers (Aspire Racing) took his 5th GP Gloucester win in a row after being surrounded by Cannondale p/b CyclocrossWorld riders Curtis White, Stephen Hyde and Ryan Trebon for the early stages of the race. 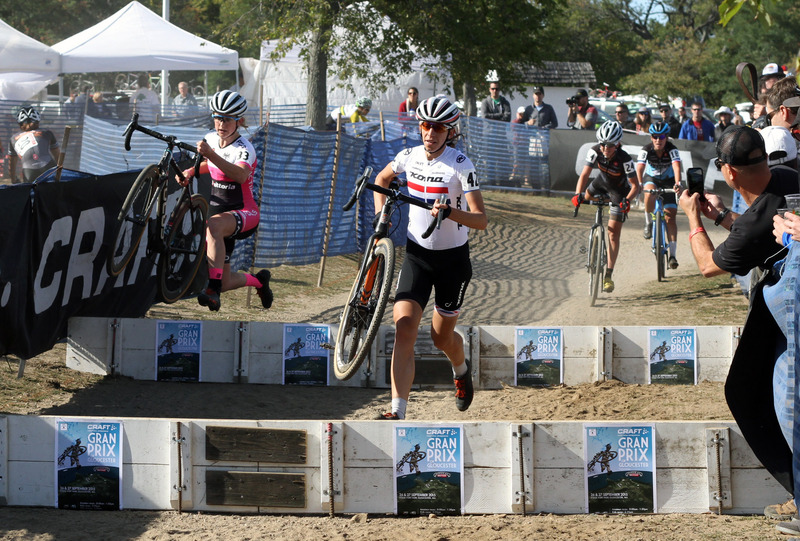 Helen Wyman took the hole shot and the British champion held court. For the first full lap she created enough separation in the field to lock in the early selection. 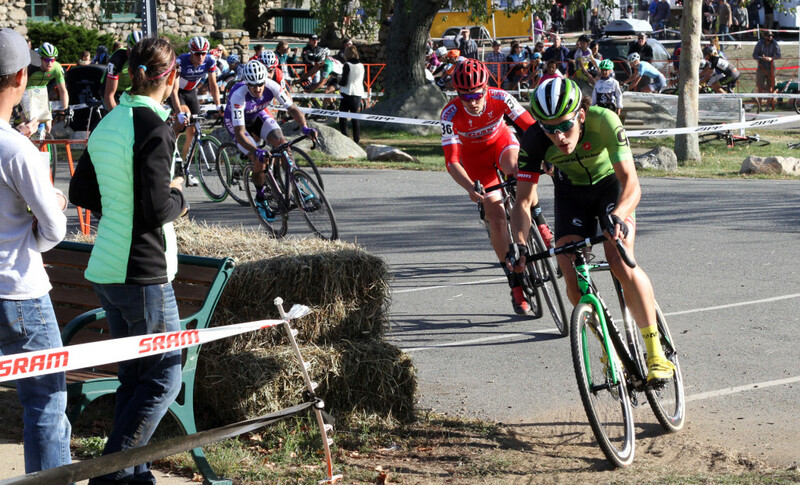 She was followed the whole way by U23 rider Ellen Noble who (in the interview video below) felt a little out of her comfort zone following the Brit so early in the race. 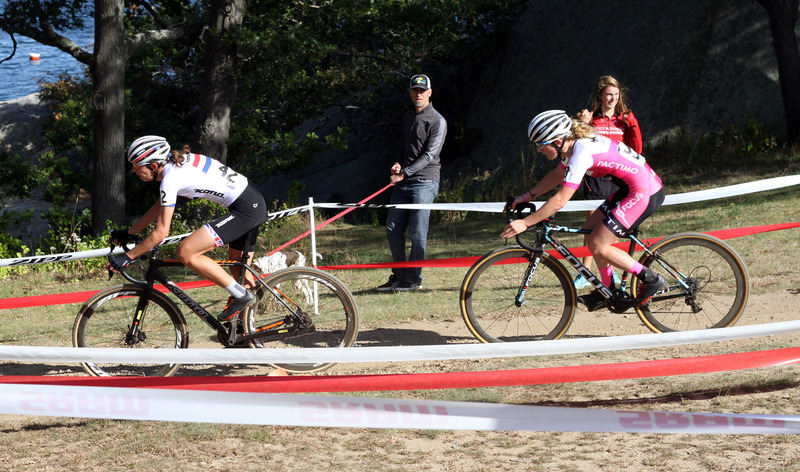 Caroline Mani, bridged up to Noble and the pair passed Wyman, who would later secure 4th place. 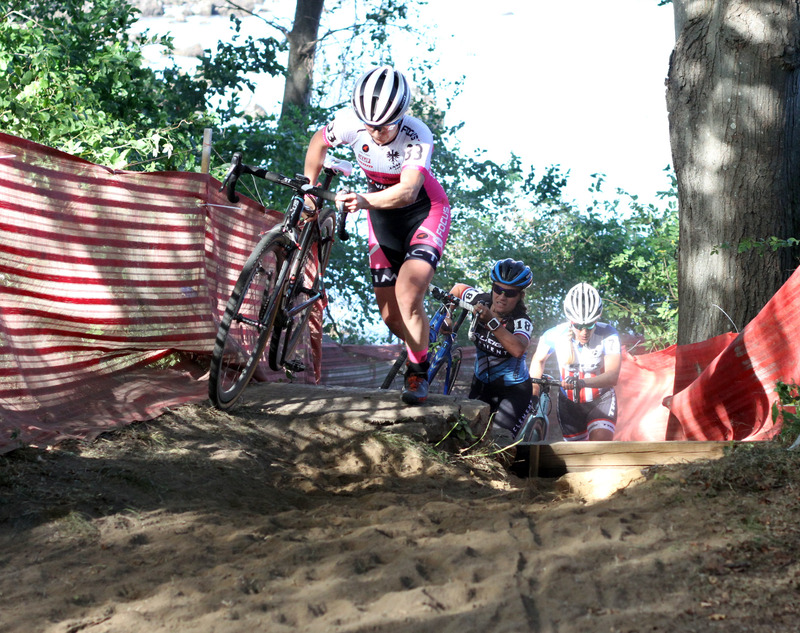 Compton also bridged to the front and the podium was secured with four laps to go. Mani, Noble and Compton would trade blows, and wait to pounce on mistakes in a tense competition. Noble and Mani seemed to have an unspoken agreement to put pressure on the reigning national champion on the hard inclines, but as soon as gaps started to form, Compton would reel them in, never giving more than a few seconds to the lead pair. It wasn’t until a rooted run-up on the back section that the final decision was made. 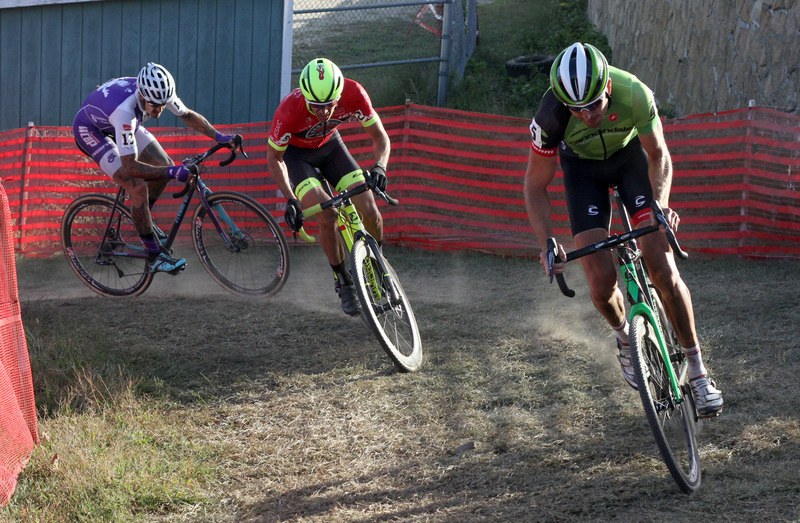 With less than a quarter-lap to go, Noble put in a hard run, and secured a gap, but bobbled and lost control on a loose-dirt turn before the finishing straight. Mani made her move and earned a well deserved win. 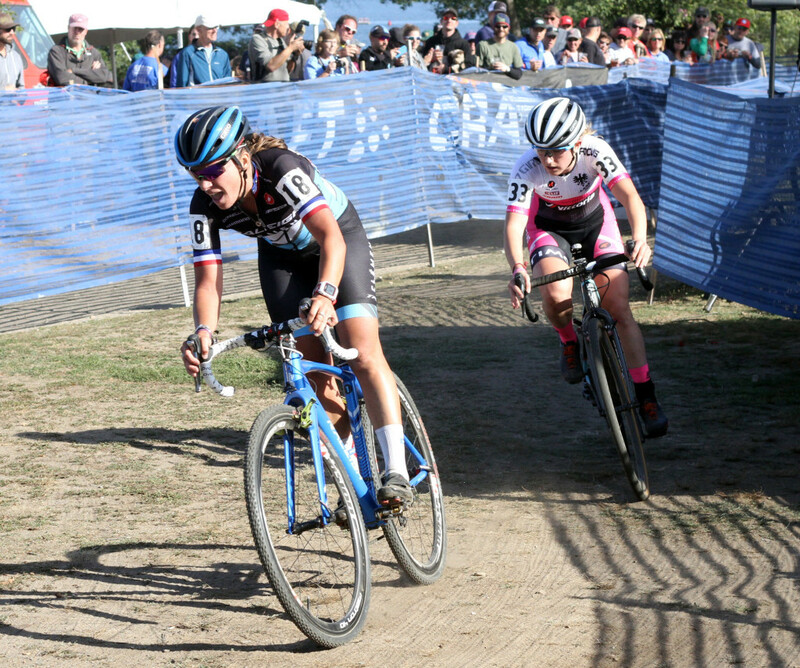 Noble, nearly clutching the biggest win of her young career, came in a convincing 2nd pace, followed by Compton. 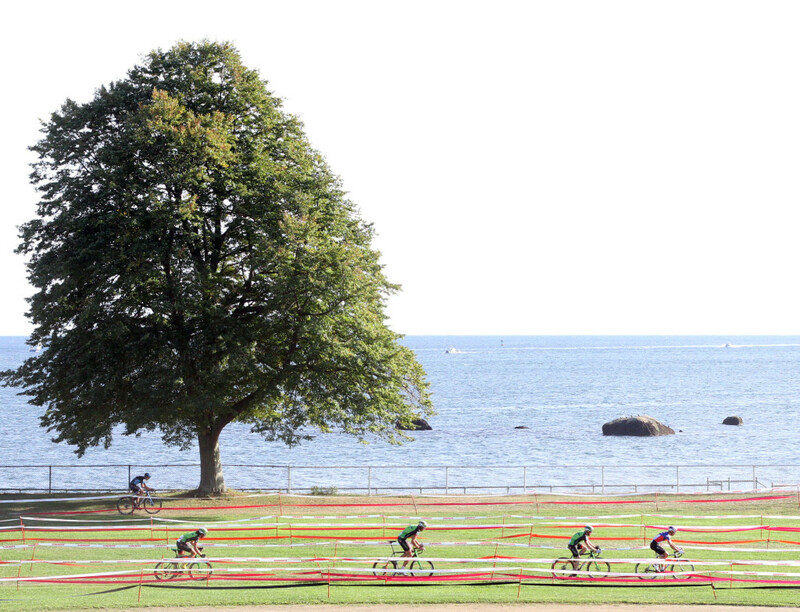 Cannondale p/b CyclocrossWorld came into Gloucester with a plan, and that plan was to make Jeremy Powers see green. 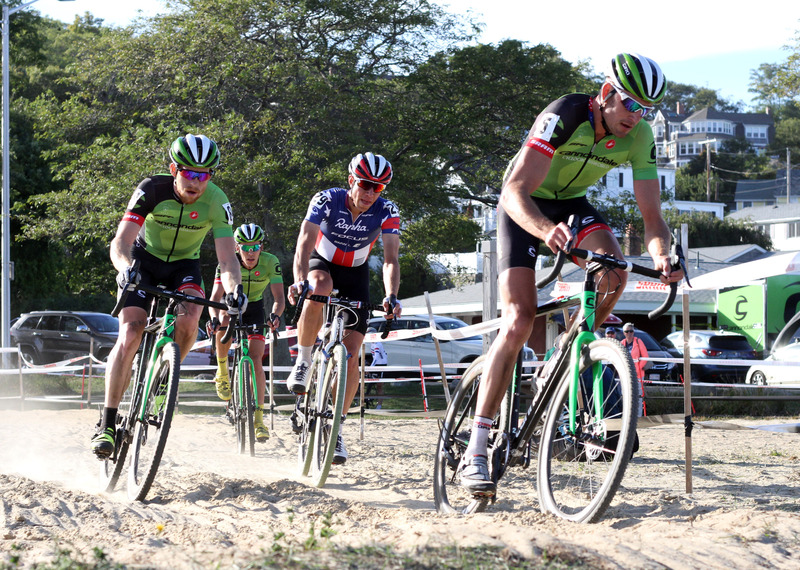 Curtis White (Cannondale) secured the hole shot and made mincemeat out of the field with Ryan Trebon and Stephen Hyde. 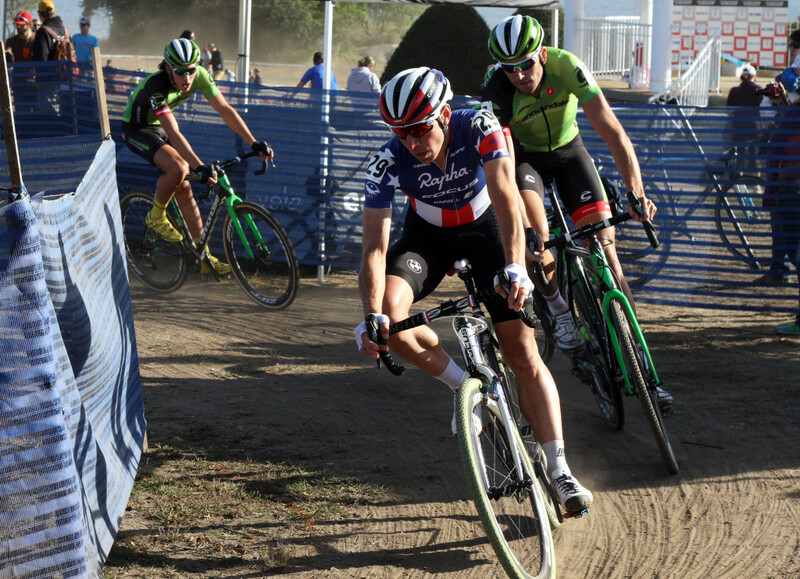 By the time the first full lap was completed, Powers and the three Cannondale riders had wind and daylight over the rest of the race. 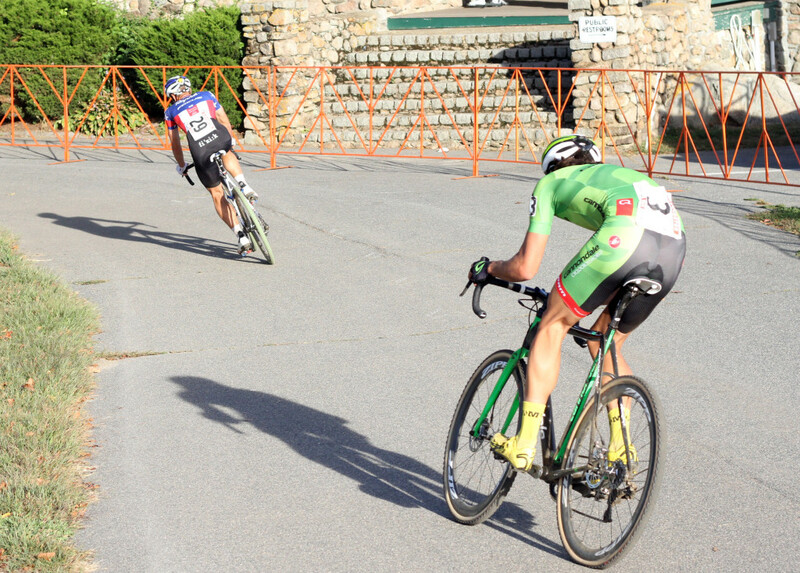 Cannondale would take turns launching attacks, pushing Powers to respond. How this plan would have played out over an entire race would have been fascinating to watch. 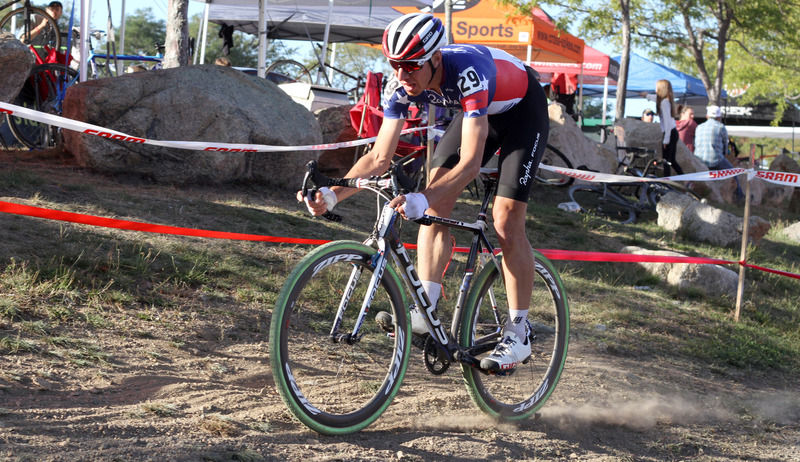 However, the rocky terrain derailed the Cannondale train. 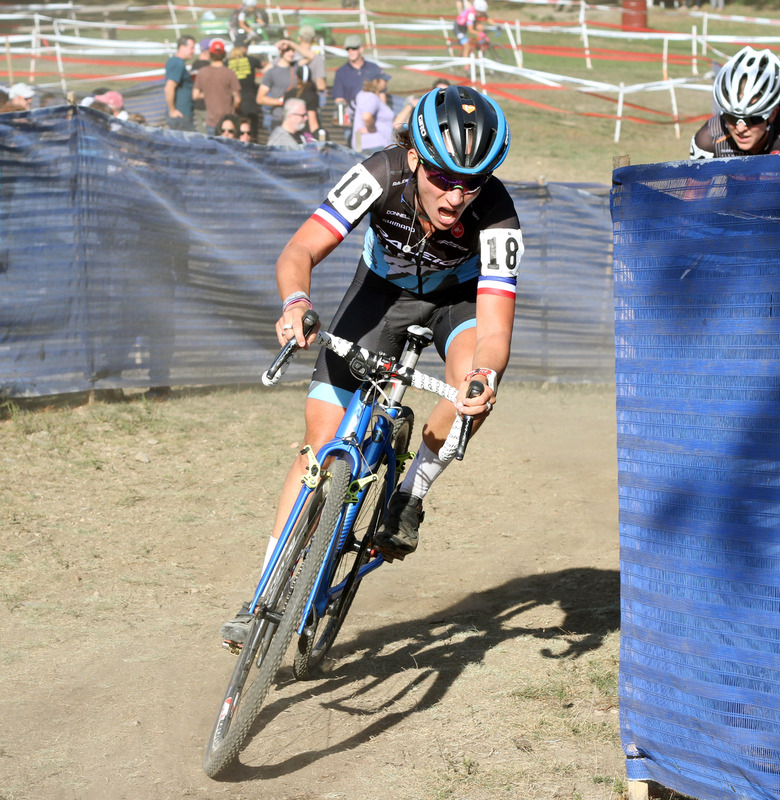 First to go was Ryan Trebon, who flatted after passing the pit. He fell more than 20 places, but showed superb form getting back into the top ten by the race’s end. Stephen Hyde would also flat shortly after and with 5 laps to go, the only green left was Curtis White, who stayed with the National Champion until two-laps to go. Powers eventually turned the screws enough to untether White, and he would hold a small, but definitive gap for the rest of the rest. 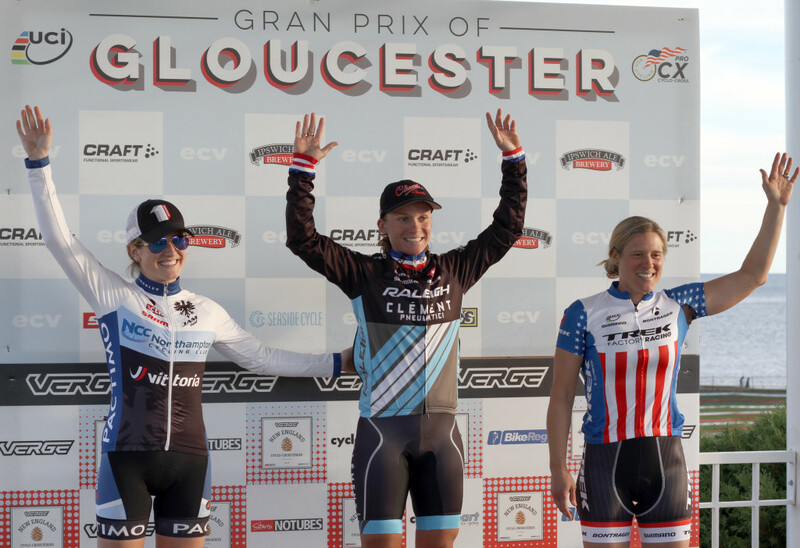 With hands raised in the air, Powers took his 5th win in a row at GP Gloucester.